SARVAM SAFETY EQUIPMENT (P) LTD.
We, Sarvam Safety Equipment (P) Ltd., feel pride in referring our employees the backbone of our company as they strive day and night to make the shopping experience of our clients the best. Based in the prime location of Tamil Nadu (India) Ã¢ÂÂ Chennai; our infrastructural base spreads over a large area where we conduct our business operations like producing Insulated Tool, Safety Gloves, Light System and more in a systematic manner. Each product we offer is made using quality assured material that enables us to maintain the industrial quality standards. Due to which we have also carved a niche in Indian market. 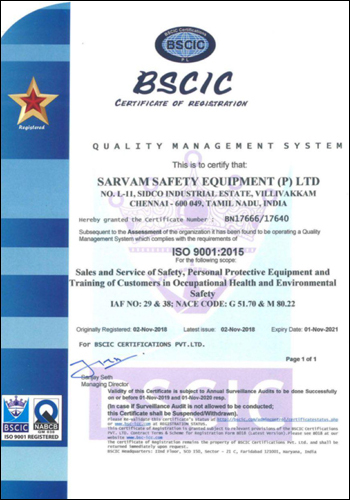 Business Specifics of Sarvam Safety Equipment (P) Ltd.